Anything can happen in Grand Prix racing – and it usually does! It was announced after the race on Sunday that popular Mexican Sergio Perez will be staying with Force India for 2017. We’re chuffed, because the team and driver are such a perfect combo – both incredibly talented and quick, with an air of underdog success. Long may it continue. This was by far the worst weekend of their debut season, with both Haas cars failing to finish the race. Romain Grosjean appeared to have some sort of braking issue early on in the race, spinning into the gravel, and diagnosing that “the brakes breaked”. Meanwhile, Esteban Gutierrez had some sort of wheel nut failure that sent his front-left sprawling into the gravel, forcing his retirement. Let’s hope they’re fighting fit back in time for the North American legs of the season in Austin and Mexico. 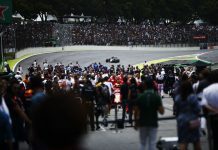 In a very uncharacteristic move, Sebastian Vettel dived down the inside of Max Verstappen and Nico Rosberg at the beginning of the race in Malaysia. He took out Rosberg who had the racing line, and nearly ruined Max Verstappen’s race too, but both recovered to finish on the podium. It marks the fourth time this season that the Weltmeister has come a cropper before the end of Lap 1, but to be fair his engine failed in Bahrain, he was squeezed in China and was punted into the wall in Russia. Nevertheless, the German is now behind Kimi Raikkonen in the standings, and just six points ahead of Verstappen. FP1 is usually quite a standard and steady affair, with most teams focusing on long runs, but the notorious Malaysia heat worsened for Kevin Magnussen ten minutes into the session when his RS16 caught fire in dramatic fashion. A valve inside the engine cover burst, and fuel haemorrhaged out of the top of the yellow machine, catching alight as it touched hot components of the car. Despite several doses of extinguisher, the flames kept re-igniting like a comical birthday candle, but the intrepid team members and local marshals did an incredible job of keeping the flames at bay while fuel was extracted from the car. On to more fortuitous Renault news – Jolyon Palmer FINALLY got his first point in F1 after 15 long races. Palmer has had absolutely terrible luck so far this season, with his previous best being P11 in Hungary, a race where he was at one stage on course to finish in the points until spinning off. His point etches him into history as not just another point-less racer, and gives him a fighting chance of matching his dad in points scored. JP senior scored 14 overall, so it will be interesting to see if Renault retain him for another year so he can get the chance to try. Obviously, Daniel Ricciardo had to do a shoey. It was a foregone conclusion. Still, it was perhaps the most entertaining and happy podium of the year, with none of the three drivers complaining about anything. Granted, none of them had their engine explode in a fireball, but it’s nice for the drivers not to have an excuse for once. Rosberg could easily have complained about being spun at Turn 1, and Max could have griped about Ricciardo not letting him past, but neither were anywhere to be seen. Thanks for the memories, lads. Probably the main talking point from Sunday’s race, Hamilton’s engine blow up on the start of Lap 41 created a proper championship swing. With Hamilton leading and Rosberg in fourth, the Briton would have re-taken the lead in the title battle by five points, but the catastrophic engine expiration means he is now 23 points down. It’s nothing short of a disaster for Hamilton who really ought to have the lead in the title, but blaming Mercedes for his woes is not the way forward. They Brackley-based team employ hundreds of hard-working people, and the notion that the team has a big red self-destruct button just waiting in the wings in case he gets too far ahead is so laughable, I actually can’t think of a metaphor stupid enough to hold a candle to it. Form dictates that Hamilton will bounce back in Japan and Austin, having won the previous two Grands Prix at both, and from then on, it’s game on, with Rosberg victorious at the final three races of the season in 2015. It will be interesting, to say the least, but don’t consider this one over just yet. As it does from time to time, the internet provided some incredible memes to complement the action of the F1 race. The quite brilliant Efforts of Grace Wilkinson and James Gibson shown here were so well-liked in fact, that the images appeared on Mexican TV! The longer this season has gone on, the more I’ve admired Nico Rosberg. 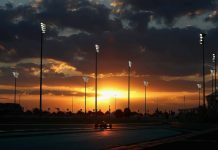 A few of his wins may have been made a tad easier with main rival Hamilton out of contention in Bahrain after being whacked at the start, and again China after starting P22. However, in the last two races in particular, Rosberg has absolutely shone, driving a flawless weekend in Singapore, and recovering brilliantly from a first-lap ‘torpedoing’ from Sebastian Vettel in Malaysia to finish a fighting third. The thing that impressed me most of all is the thing that nearly confounded his race further. I’m of the opinion that Rosberg’s move on Kimi Raikkonen was brilliant and that a ten-second penalty was a laughably strict reward. It was of course not the cleanest manoeuvre, with the German trimming the edge of Raikkonen’s front wing, but it’s an aggressive overtaking mentality not often seen from the usually calm and smooth Merc man. It’s something you might expect from Hamilton or Verstappen, and that can only be a good thing. The Red Bull boys are one of the strongest line-ups on the grid, and they showed their mettle once more on Sunday with an epic duel throughout the middle of the lap on Lap 39. Both were around 25 seconds behind race leader Hamilton, who was busy building a gap to his pit stop, although we know how that ended. Neither driver gave an inch, holding their lines as they navigated the twisty middle sector, including the fearsome sweeping turns of 5 and 6. It’s a good thing Sepang is one of the widest tracks on the calendar as they looked like they needed it, but the respect and awareness shown made it perhaps the best fight of the season, akin to Rosberg and Hamilton’s scrap in Bahrain 2014. Russian Roulette? – Who Is this Vitaly "rocket" Petrov?